BNF Healthy Eating Week 2019 - start planning! Thank you for registering for BNF Healthy Eating Week which will be running from 10-14 June 2019. You can run your Week after the 10-14 June if that's works better for your school or nursery. Sleep well - NEW for 2019! Your school or nursery might wish to focus on a different challenge each day of the Week or pick one or two to focus on throughout the Week - it's up to you! We are busy preparing resources to support the challenges, but we've put together some ideas below to help kick start your planning! School/nursery breakfast - hold a school/nursery breakfast. Get everyone involved, e.g. bringing in food, setting up tables. You could invite parents/carers along too! Prepare a special breakfast - as a class or form prepare or cook a breakfast together, e.g. overnight oats, layered fruit and yogurt cups, a vegetable omelette. Breakfast display – create an inspiring display of healthy breakfasts eaten around the world. Veggie snack platter – prepare a colourful display of crunchy vegetables to offer at breaktime, e.g. cucumber wedges, carrot sticks, pepper sticks. Delicious veggie dish – challenge pupils to design a vegetable-based dish for the canteen to serve during the Week. Plan this with your catering staff in advance - you could make it into a competition! Fruit tasting session – hold a themed fruit tasting session, e.g. seasonal fruit, tropical fruit, types of berries. Water waiters – task individuals to offer and serve water to other pupils at lunchtime. Infused water station – prepare jugs of water for the classroom infused with different flavours, e.g. mint leaves, cucumber. Drink display - create a class or form display with a ‘drink-o-meter’ to track the drinks consumed over a day or more. Add healthy hydration tips and facts to the display for inspiration. Get up and go – plan a class or form activity to get everyone moving, e.g. a stretching or yoga session, a brisk walk, game of tag, circuits activity, sports day! Vertical working – set up standing work stations or have a lesson in transit, e.g. ‘maths on the move’! Try something new – organise taster sessions of different types of activities, e.g. tap dancing, racketball, Tai Chi. Sleeping beauty - set a sleep challenge, e.g. can your class or form sleep for 300 hours tonight? Sleep board – share tips for a good night sleep on a 'sleep' display board. Settle for sleep – task pupils to write a plan for winding down for a good night sleep. 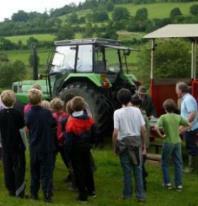 plan a visit to a farm, alloment, or food market so children can learn more about where their food comes from. Five free posters for the first 8,000 registrants! 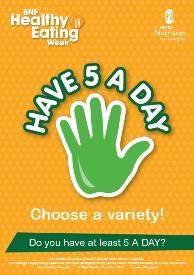 We have created a new, colourful poster to support each of the five BNF HEW challenges. If you have received this newsletter, your posters will be arriving in April! Why not encourage colleagues and friends working in other schools or nurseries to register so they receive a free set of posters too? We will be in touch soon with details of all the other resources for the Week! BNF Healthy Eating Week is developed by the British Nutrition Foundation and supported by the Agriculture Horticulture Development Board (AHDB) and Garfield Weston Foundation.